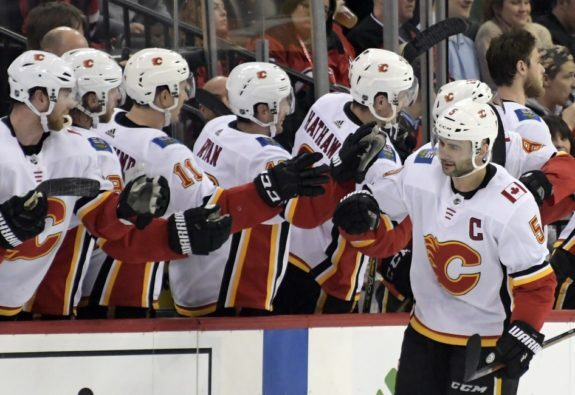 The Calgary Flames' MVP - Johnny Gaudreau or Mark Giordano? The Flames’ MVP – Gaudreau or Giordano? The Calgary Flames are enjoying their best on-ice performance in 30 years. In the standings, the team is seeing successes they haven’t seen since the 1988-89 season that netted them a Stanley Cup. While the team’s success is a product of a collective effort, two players have really driven the group to new heights in 2018-19: captain Mark Giordano and leading scorer Johnny Gaudreau. But which one is more deserving of Hart Trophy consideration as the team’s most valuable player? If you want to be blunt, Gaudreau is one of the most dynamic players in the entire National Hockey League and worth the price of admission by himself on most nights. The 25-year-old product of Carney’s Point, New Jersey – a Philadelphia suburb – is generously listed as 5-foot-9 and 165 pounds, but he’s an absolute dynamo when given time and space by the opposition. Gaudreau has set career highs in goals and points, and he’s put together 25 multi-point evenings – a surefire sign that when he’s on, he’s really on. In addition, he’s become the team’s offensive engine and when they need a big goal he’s typically the guy on the ice counted on to deliver. He plays on the top line and the first power play unit, and has either scored or set up 21 tying goals and 31 go-ahead goals. All of his accolades come while being one of the most physically targeted players by the opposition and often not getting the benefit of the doubt from officials – he’s so small that many “regular” hits look like he’s near death, so when he’s actually getting walloped it’s difficult to tell how bad a hit actually was. Giordano is one of the most fascinating stories in the entire NHL. Undrafted but managing to find his way into both major junior and pro hockey, he was looking into college courses when the Flames signed him in 2004. Since then, aside from a season-long jaunt to the Russian Superleague due to a contract impasse, he’s quietly built up a very unique and consistent skill-set. Mark Giordano reaches the 60 point plateau at 35. Just the 4th defenceman in history of the NHL to do so. At 35 years old, Giordano has emerged as one of the NHL’s top defensemen and the Flames’ captain and most consistent player. He plays in every key situation: the top defensive pairing, first power play unit, first penalty kill unit, five on threes, key shutdown opportunities and any other stressful situation. He’s his team’s oldest skater and he’s being asked to carry the mail basically every night from a game management perspective – and the crazy thing is he’s succeeding at it. A fitness freak who had to work his way up from the minors, Giordano brings a grinder’s mentality to his role and that’s arguably what fuels his consistency. He’s registered shots of 71 of 76 games he’s played and gotten a point in all but 30 games that he’s dressed for (and he’s a defenseman). If the definition of “valuable” is the player that’s most often the difference-maker for the team, then the Flames’ most valuable player is Gaudreau. He’s a wizard with the puck and capable of theatrics and heroics on any given night. But Giordano’s impact cannot be understated, either. Since taking over as captain after Jarome Iginla’s 2013 departure, the veteran blueliner has elevated his game and become a consistent Norris Trophy contender. Moreover, his consistency and resiliency has elevated the team on many occasions and provided the emotional lift that they’ve needed at key times. Without Gaudreau’s razzle-dazzle and ability to take over a game, the Flames wouldn’t win key games. But without Giordano’s maturity and ability to manage a game’s pace, the Flames wouldn’t be in a position to win. Gaudreau is the John Lennon to Gaudreau’s Paul McCartney. Gaudreau is the most valuable Flame, but because Giordano often creates the conditions for him to be a difference-maker.